Here in the States we have gotten quite accustomed to seeing Qualcomm and their Snapdragon line of processors in our domestic devices, including Samsung phones like the Galaxy S4. Samsung is a global company, however, and looks to keep their own line of Exynos processors going. 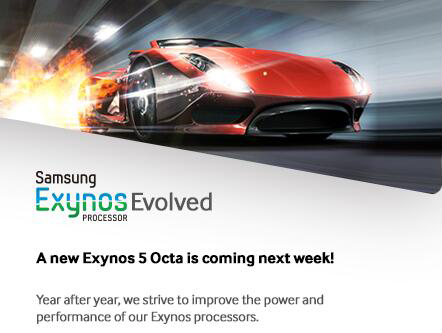 Samsung took to Twitter today to tease us with the snippet that “a new Exynos 5 Octa is coming next week!” Samsung also figured that nothing celebrates a new processor launch better than a Twitter giveaway. Unfortunately, Samsung is saving the details for the new Octa until next week when it is announced. All we know at the moment is that it is “more powerful” and “enhanced” over the older version. 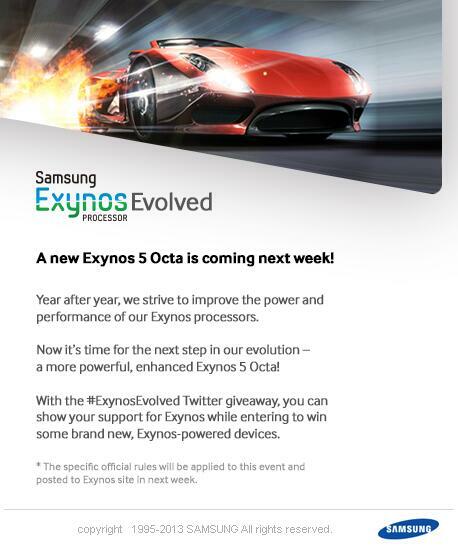 In their teaser today, Samsung also said that once the new hardware is announced there will be a #ExynosEvolved Twitter competition with the winners getting some “brand new, Exynos-powered devices.” This could mean some of their devices that feature older versions of the Exynos chipset, but it could also hint towards us seeing the new Octa being in an upcoming device. Note 3 maybe? Either way, next week is shaping up to have lots of announcements with Verizon, Google and now Samsung having events. Are you excited for what Samsung has to show?